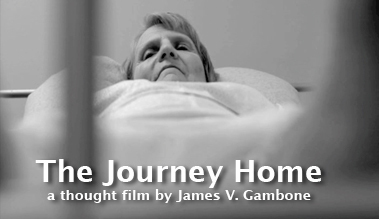 Points Of View Productions Inc.
"The Journey Home" is a 10-minute “thought film” intended to provoke a deeper awareness of and conversation about the issue of long term care—a subject that will be of high interest during the next 25-30 years. Right now, there are no plans in place at any level of government to accommodate the millions of people who will need end-of-life care. What does this mean for our society? This film will provide a platform for conversation and hopefully, provoke action toward addressing the issues of long term and end-of-life care. For more information, go to The Journey Home website. Points Of View offers full-service video, audio, and graphic multi-media services—featuring our award-winning Executive Producer, Jim Gambone and Art Director, Wendy J. Johnson. Change the Glass Now! – a six-minute video, made for the Minneapolis Chapter of the Audubon Society. This video was created to make all generations aware of the need to protect migratory birds from colliding into glass building structures—such as the new Minnesota Vikings stadium. View video on YouTube. A Healing Walk – a half-hour, made for television documentary, responding to the tragic school shooting at the high school on the Red Lake Reservation in Red Lake, Minnesota. Working with teachers and students at the Bug-O-Nay-Ge-Shig Native American Charter School in Cass Lake, MN; Jim helped document the first region-wide response made by the surrounding tribes and people of all colors and generations. The walk covered 61 miles, from the "Bug" School to the Red Lake Nation. This inspiring story will be used to generate Intergenerational Dialogues about how the region can continue to heal and create a better life for people of all ages. Partial financial support for this project was provided by Lutheran Social Services Disaster Relief. View video on YouTube. Stop the ReRoute: Taking a Stand on Sacred Land – a feature-length documentary, telling the dramatic story of the confrontation between neighborhood activists, environmentalists, Native American leaders, and The State of Minnesota during the construction of a major highway and light rail corridor in Minneapolis. This confrontation, in the December of 1999, resulted in the largest police action ever undertaken in the history of Minnesota and the destruction of an encampment and Native American spiritual site. As the Executive Producer, Jim was responsible for bringing this largely untold story to a national and international audience. Working with 2 filmmakers, Jon Carlson and Annie Follett, this multi-generational story confronted major questions dealing with progress versus sacred lands, the environment, and highways. It also told the story of Earth First's initial urban action in the United States. Camp Noah – a promotional video for Lutheran Social Services, Disaster Relief, explains a week-long day camp experience for children (Kindergarden - 6th Grade), who have been affected by national or man-made disasters. The camp includes: trained counselors, mental health professionals, and volunteers. The childrens' week-long faith-based journey, follows the story of Noah and the Ark through music, role-playing dramas, crafts, and Bible stories. The young people are able to understand the trauma they've experienced, talk in a safe setting about their experiences, and see a rainbow of hope for their future. New Immigrant Stories – 2 video documentaries sponsored by the Worthington Integration Collaborative, Worthington, Minnesota. ©2019, Points Of View Productions Inc.